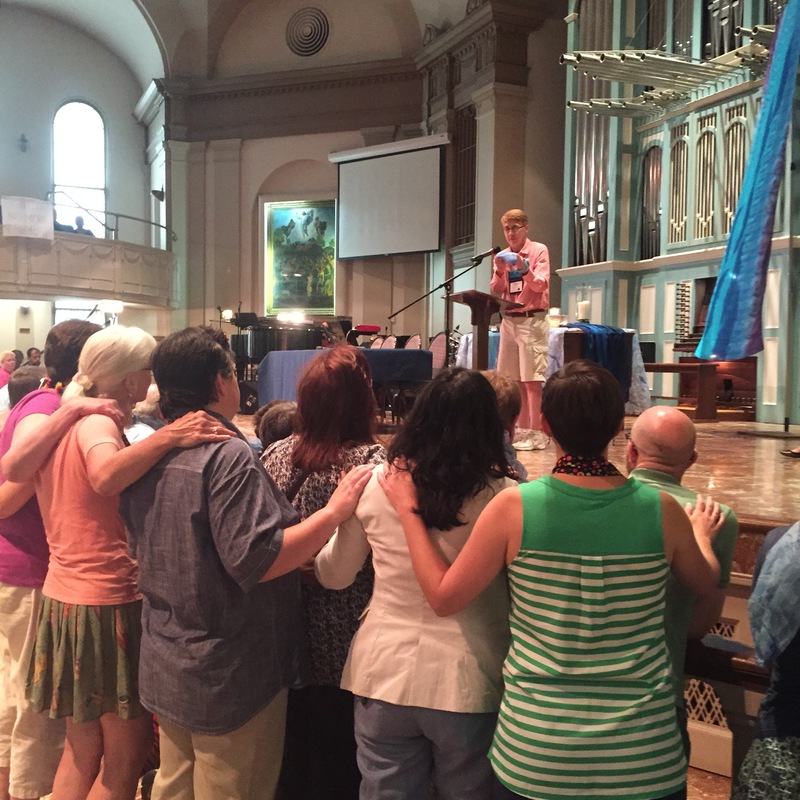 Soulforce has been an intimate part of the United Methodist movement for LGBTQ inclusion and justice in the United Methodist Church, particularly during our General Conferences. As Soulforce will work closely with Love Prevails during the 2016 General Conference in Portland, I wanted to share some of my experience with Soulforce over the years. It is important to understand how this organization has shaped the moment of potential change that we are in as Methodists seeking justice for LGBTQ people. I heard the name Soulforce while preparing for GC2000 in Cleveland. Soulforce had been recently founded and led by Rev. Mel White, a former speech writer for televangelist Jerry Falwell. He became well-known after publishing Stranger at the Gate, about coming out as a gay man in that conservative evangelical Christian context. Soulforce is an LGBTQ-determined organization comprised of Christians, people of other faiths and people of no faith. They are not faith-based, they offer a Soulful critique of Christianity as a structure. In 2000, their focus was traveling around the U.S., (non)violently disrupting big denominational meetings. For the General Conference in Cleveland, Rev. 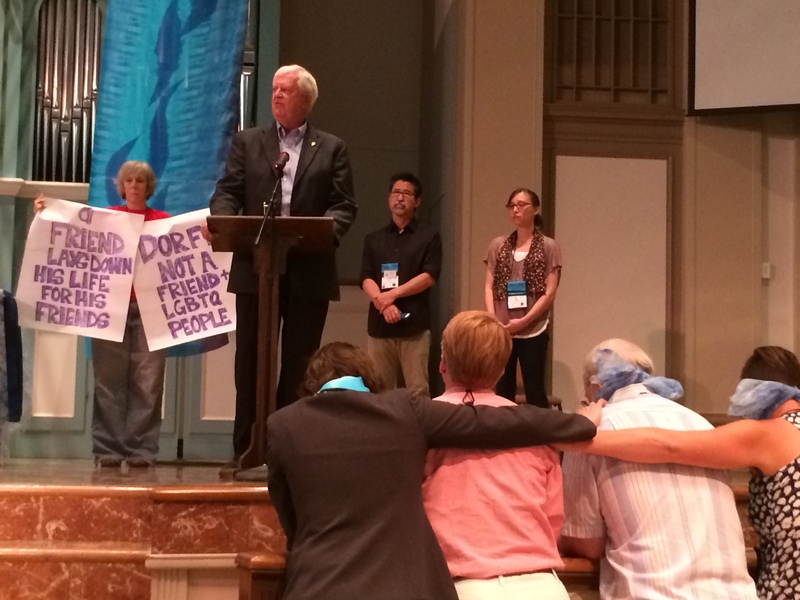 White organized well-known leaders – Greg Dell, Jimmy Creech, Joe Sprague, Phil and Jim Lawson, Arun Gandhi – to be arrested on the streets outside of the Convention Center in order to bring light to the matter of LGBTQ injustice and exclusion in the part of Christ’s body called the United Methodist Church. Soulforce invited United Methodists to join their members in this act of civil disobedience outside of the convention center. If you wanted to participate in this act, you were required to receive a training from Soulforce. Some 190 folks were arrested that day. Most of us were not Methodist. Soulforce communicated with the police and guided us in the process, from booking to jail holdings to court hearings. We faced the inevitable questions: was it worth it? Did it make a difference? Did the arrests impact what went on inside the building that day? The impact was huge. Soulforce made a clear statement to the General Conference. They were organized. They were prepared. They were not messing around. They were intent on facing down LGBTQ discrimination within the Christian community. It was front page news in Cleveland the next day. This Soulforce action outside of the Convention Center inspired and laid the groundwork for and inspired an action that led to 14 more people being arrested on the plenary floor inside of the General Conference on the next day. All of those arrested the second time were United Methodist. 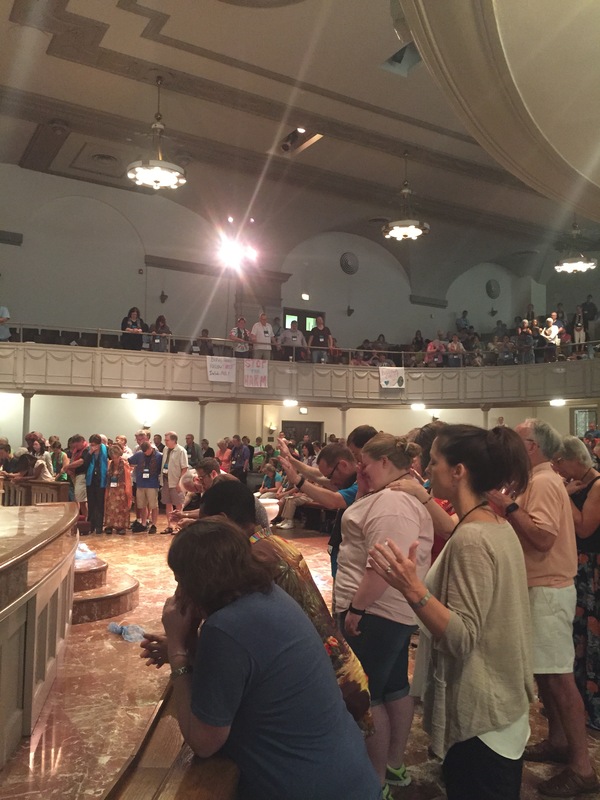 All of the arrests outside and inside the plenary shamed the denomination. That same foundation impacted General Conference 2004 in Pittsburgh. Many movement veterans remember an incredibly moving, mass witness that year that we called The River Of Life. Hundreds of queer folks and their allies filled the plenary floor and took the stage in a huge river of rainbows. United Methodists were at the head of the human river that flowed into the hall, but the reason we made it in there at all was Soulforce. Because of demonstrating their commitment to taking serious and well-prepared disruptive action in 2000, the bishops agreed to enter into negotiations with Soulforce leadership in 2004 in order to avoid another series of humiliating public arrests. Soulforce had the experience. Soulforce had the direct action credibility. They helped us negotiate the peaceful River of Life. While in 2004 some members of our movement spent countless wasted hours negotiating yet another “agree to disagree” petition in Pittsburgh, Soulforce then spread out on the streets around the Convention Center to make a witness to the world. During these two General Conferences, the movement’s attitude to Soulforce was tepid, if respectful. They made our Methodist movement feel nervous and look weak. They were blamed for being outside agitators, not respecting the long work of Methodist progressives in between conferences. Despite forty years of resistance in our denomination, the situation for queer people and their allies has only gotten worse. Soulforce pushed at the calls for the incrementalist, legislative approaches of our movement that clearly had been and were going to be ineffective. Soulforce understood that basic Gandhian claim that, once dialogue and efforts to compromise continue to fail, disruptive direct action is what will bring people in power to the table to talk real change. At the General Conference in Fort Worth in 2008, Soulforce did not plan a large-scale disruptive witness. By then, two long-time Affirmation members, Steven Webster and Jim Dietrich, who were well-trained Soulforcers, represented Soulforce to our movement. Steven Webster, myself and Troy Plummer constituted a negotiation team with the United Methodist bishops about any disruptive actions that might emerge. Steven and I were chosen for the negotiating team because of our experience with nonviolent disruptive action, the tools for which Soulforce had given us. Once again, Soulforce’s history of determined training and action lent us the credibility to be at tables of power, and to take up the mantle of collective action. In Fort Worth, Soulforce had the foresight to secure a public permit for occupying a park across the street from the Convention Center for the entire length of GC. Some of the most powerful moments of GC2008 took place there. Soulforce gathered long-time LGBTQ justice allies Jimmy Creech, James Lawson and Gil Caldwell for a conversation after a public showing of For The Bible Tells Me So. They organized a panel on justice for transgender people in the park. Sue Laurie and Julie Bruno held their wedding there. They also brought the sound system. In strategic nonviolence, all of these details create impact. Without Soulforce, our movement would not be where it is today. In all of our United Methodist efforts for change over the years, there has often been a fear of messages and actions coming from people that seem too radical or disruptive of the status quo. Since our formal inception as Love Prevails, Soulforce has walked beside our group with their trainings, counsel, presence and moral support as Love Prevails has emerged within our denomination to work for a more radical and disruptive witness that has been Soulforce’s hallmark. In my estimation, Love Prevails now stands within our movement as an inheritor of the disruptive tradition that Soulforce has brought to our movement over the years. People in our movement don’t necessarily like Love Prevails for the same reasons they didn’t like Soulforce. We make them nervous. We ruin their plans. Though a number of our team are long-term insiders of the movement, we are considered outsiders by many mainstream LGBTQ Methodists and allies. We thank Soulforce for standing with us in the last four years to inspire, cajole and train us. Some of the best moments we may claim as a movement at this General Conferences will be a result of Soulforce’s outside agitation, experience, preparedness, creativity and willingness to take risks. We continue to need Soulforce’s experience in strategy and nonviolent resistance. We need alliances and collaboration to broaden our vision for what is possible and to give us strength. I hope that you will support our efforts to forge resistance together. If you are going to be in Portland for General Conference, please come to the training with Soulforce on nonviolent direct action on Wednesday, May 11. This is the fourth in a series of interview reports that Love Prevails is conducting with representatives of every member group of LYNC as a part of preparing for General Conference 2016 in Portland, Oregon. We share what each group brings to the Coalition, their particular emphases and concerns for GC2016, and the challenges and benefits of working across various kinds of differences related to identity, opinion and action. Walter Lockhart is the Affirmation Council’s representative to the Love Your Neighbor Coalition (LYNC) at General Conference (GC). However, Walter is not an official spokesperson for the group because he is not a gay man. He is an ordained elder in the Minnesota Annual Conference, where he is appointed to two churches and serves at Star Lake Wilderness Camp. Lockhart explained that it is sometimes unclear what Affirmation’s role and presence is at General Conference (GC), because there not much thought among the group that GC is the place where action to make change will be most effective. Affirmation’s current witness has a different focus than the larger mainstream lesbian and gay movement in the UMC. He said, “Our focus right now is more on people who are being persecuted for who they are than people who are doing gay marriages, people who are being persecuted for being LGBTQ.” Affirmation is interested in generating support for queer folks in places like Uganda. This is the third in a series of interview reports that Love Prevails is conducting with representatives of every member group of the LYNC as a part of preparing for General Conference 2016 in Portland, Oregon. We share what each group brings to the Coalition, their particular emphases and concerns for GC2016, and the challenges and benefits of working across various kinds of differences related to identity, opinion and action. With such a wide agenda for justice, MFSA prioritizes its programmatic responses to these intersecting issues. Once all petitions to General Conference have been submitted, MFSA will distill its focus and develop “Plumbline” position papers linking General Conference petitions to those issues.